Are you concerned about over-crowding in our schools and the impact of all of the new developments in South Reno? 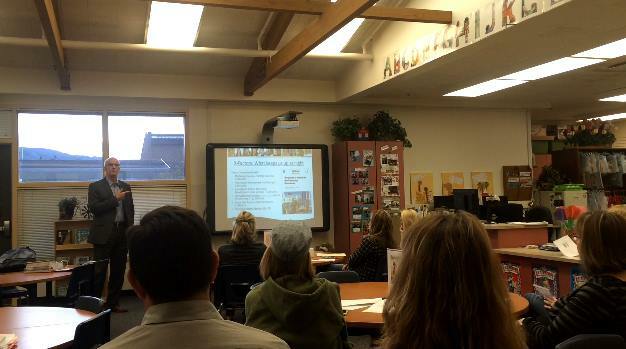 Parents and others at tonight’s PTA meeting at Hunsberger Elementary heard the facts first hand. Washoe County School District (WCSD)’s Chief Operating Officer Pete Etchart delivered a powerful and informative presentation about the school district’s overcrowding challenges. WCSD COO Pete Etchart discusses the state of our schools and facilities at the Hunsberger PTA meeting. Pete Etchart talked about the how the district is in a “perfect storm” of overcrowding, growth, repair backlog and limited funding. He also discussed the impacts of the November ballot question to increase sales tax to fund facility improvements. Did you know elementary schools are at 106% of capacity, middle schools are at 98.5% of capacity, and high schools are at 109.5% of capacity? Without the ability to expand our facilities, we are looking at split schedules, meaning two separate schools run out of one facility. What does that mean? A school would have morning hours of 6 am (which means 4:30 – 5:30 am bus pick up) through 12, and a separate schedule from 12 – 6 pm (with bus drop off between 6:30 – 7:30 pm). Imagine the challenges this will pose to working parents, parents with children in different schools, and extra curricular activities. Please get the facts so that you can make an informed decision in the voting booth this November. Many thanks to Erin Belosic for including this presentation in the agenda and to Lynnette Bellin for posting on Facebook! This entry was posted in ArrowCreek 411, ArrowCreek411, Hunsberger Elementary, Pete Etchart, Washoe County School District and tagged ArrowCreek 411, ArrowCreek411, Hunsberger Elementary, Hunsberger PTA, Pete Etchart, Washoe County School District, Washoe County Schools Overcrowded. Bookmark the permalink.